Today I did a magic juggling act between my day job and my life as a beauty blogger and left work early to rush across town to go to a couple of beauty press events, although in the end I was so busy chatting I never made it to the second…. The one I did make it to was the unveiling of Marks and Spencer’s latest range of beauty products and I have to say I am extremely impressed with what I saw. 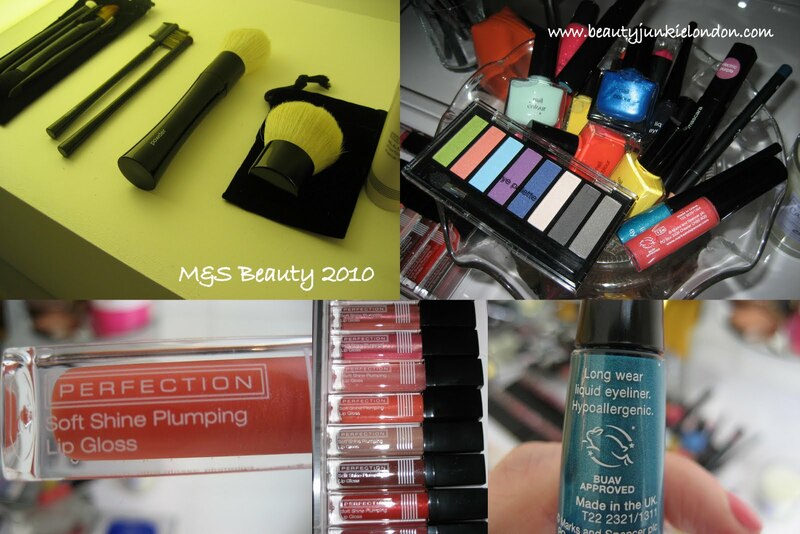 The whole range of M&S beauty has been made-over for 2010, and not just the packaging – formulas have been re-worked too. 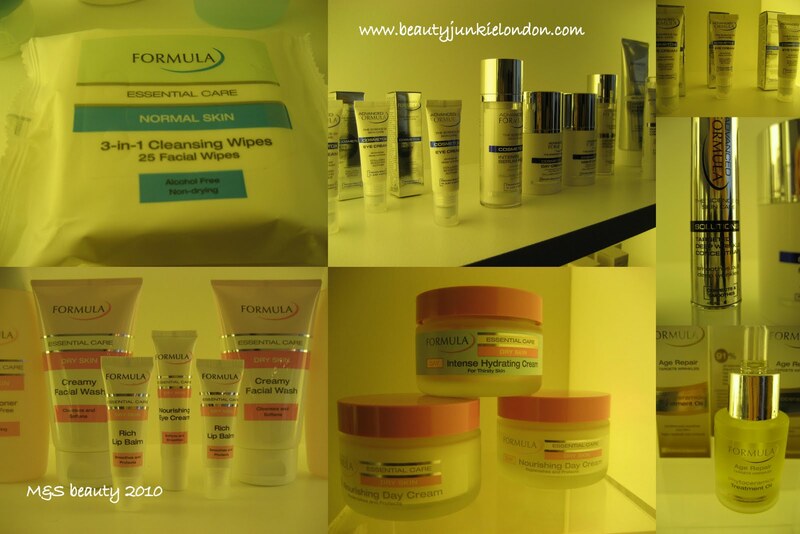 The skin care formulas have been streamlined into different categories catering for different skin needs, from sensitive skin (Formula Essential Care), the first signs of aging (Formula Age Defence), plus two formulas for mature skin (Age Repair and Age Restructure). Plus on top of all this is the Advance Formula range of products to treat specific issues. As if that wasn’t enough – the new make-up bits are equally impressive. Stand out pieces for me were the Chanel-esque eye shadow quads, a pretty lip gloss from the essential range in the colour ‘tangerine’, a deep purple mascara, the make-up brushes (very soft, and something a bit ‘Sonia Kashuk’ about them), a white-pink eyeliner, the perfection skin finish blushers…. the list goes on! I have been given a selection of the new products to test out, including the six ‘Beauty Heroes’, one of which I am hoping might be a more affordable treatment oil (Age Repair Phytoceramide Treatment Oil, costs £7.50) the the Anne Semonin I recently tried out. So I will get on that and report back. 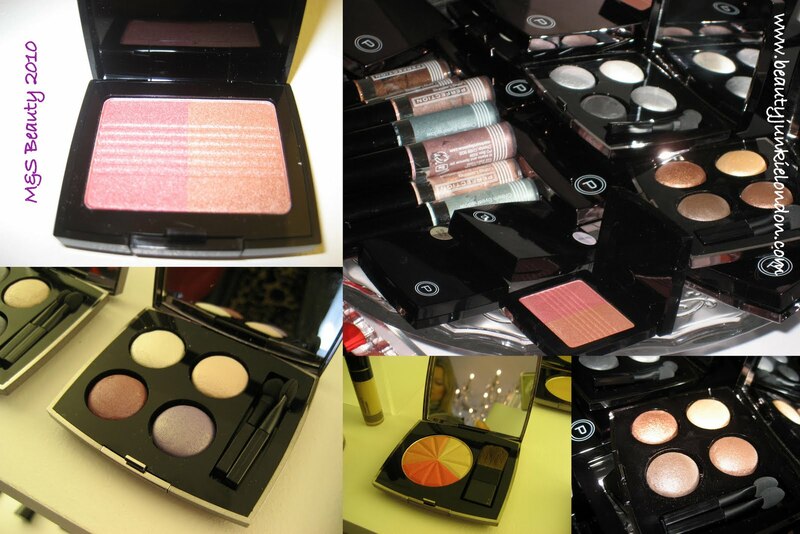 But check out the pictures for a bit of a preview – as not all the products shown are available in store yet. I like the look of those eyeshadow quads, did you get a chance to try them at all? Oh, the blue/teal liner looks only gorgeous! Do you know when exactly the new range will be available in shops? I had a bit of a play with the quads and they were well pigmented, especially for the price. Also, very smooth. The liner was lovely, and really cheap too. It’s nice to see M&S being brave with the colours- I will check the release dates and let you know when bits will be in store. I’ve always thought M&S make-up was a bit on the dull side but this new range looks fab…I really love the look of those quads! Oh wow, that actually looks quite nice! Never really considered M&S for make-up or skincare, but those brushes and eyeshadows at least LOOKS really really nice. Can’t wait to read your review on the products you got! Omgosh… I used to really hate the M&S beauty range… it just looked cheap and rubbish! Looks good, looks as though I’ll need to go find a big M&S to see what I can get hold of.